Vox Political: Shami Chakrabarti Wants to Convict Livingstone Without Evidence. Perhaps She Should Step Down? On Sunday, Mike posted up a piece commenting on Shami Chakrabarti’s statement on the Beeb’s Sunday Politics that she did not believe that there was any reason for Livingstone to remain in the Labour party. Chakrabarti is the Labour party’s Shadow Attorney General, and the author of the report into racism and anti-Semitism in the Labour party. Livingstone was accused a year or so ago of bringing the Labour party into dispute by making entirely accurate statements about Adolf Hitler and the Nazis initially cooperating with the Zionists to send German Jews to Palestine. 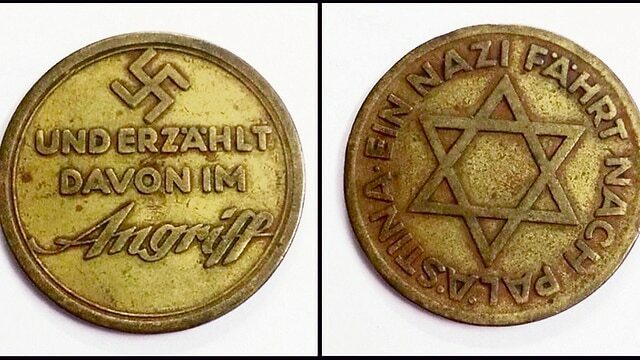 The Nazis even sent one of their members to the nascent Jewish settlements, and struck a medal in commemoration. There is no question that this is all historical fact. The brief period of cooperation between the Nazis and Zionists is called the Haavara Agreement, and is documented on the website of the international Holocaust museum in Israel. Tony Greenstein, another Labour member falsely accused of anti-Semitism and expelled, has provided extensive documentation of it on his site, including reproduction of the Zionist newspapers, like the Judischer Rundschau, which heartily supported the Nazi regime and urged Jewish Germans to ‘wear their yellow stars with pride’. Mike states in his article that Livingstone has made several dubious statements about the relationship between the Nazis and Zionists since then, but these are not what Chakrabarti is referring to. He also states that as a lawyer, Chakrabarti should know that under British law, you are innocent until proven guilty. Livingstone has not been tried yet. His case is due to be examined in three month’s time. Mike makes the point that this is part of a wider campaign to destabilise Jeremy Corbyn’s Labour party by claiming that the party has been full of anti-Semites since he took over its leadership. This is entirely false. Corbyn is not an anti-Semite, and neither are very many of the people, who’ve been accused of it. Many of them are decent people, who are sincerely anti-racist. As I’ve pointed out over and over again, very many of the victims of these smears and libels are Jews, who have suffered genuine anti-Semitic abuse and assault. Even more shameful is the fact that a number of these people are the children of the very fortunate few, who managed to survive the Holocaust. This to me clearly shows how utterly wicked these libels are. Anti-Semitism has actually fallen in the Labour party since Corbyn took power. And the real crime of the people falsely accused of it, is that they have criticised Israel or supported the Palestinians. Those making these smears are the Israel lobby and the Blairites in the Labour party. They are repeated by the Tories and the right-wing media. Mike makes the point that it is these villains, who Chakrabarti should be demanding to be investigated, not Livingstone. Instead, she seems to feel that Livingstone’s membership would, in Mike’s words, attract far too much criticism to the Labour party. And so she is trying to appease them. This is profoundly and utterly wrong. You cannot appease bullies. The expulsion of genuinely decent people from the Labour party on these trumped up charges has taught the Israel lobby and its collaborators that they can continue smearing people with impunity. Throwing Livingstone to them will only serve as further proof that their vile tactics are successful, and that they can continue until Corbyn himself is removed, or left without significant allies. It is also extremely dangerous to real history, as it shows that politicians can rewrite it completely and erase embarrassing episodes that nevertheless happened. Just like the Nazis try to deny the Holocaust, because it brings shame and hatred upon them, the Israeli state has been trying to suppress the truth of their own massacre, persecution and ethnic cleansing of the Palestinians. They attempt to suppress any mention of it through smearing those who do as anti-Semites. And their attempts to suppress the reality of the Israeli state’s persecution of the Palestinians also has real consequences. It’s how the Israeli state and its soldiers believe they can get away with the mass murder of Palestinian protesters yesterday with only the flimsiest of excuses: that they were put up to it by Hamas, and are a militant terrorist threat to Israel. The Israel lobby, including the Board of Deputies of British Jews, the Campaign Against Anti-Semitism and Labour Friends of Israel believe that if they hide the evidence of the Nakba and ongoing persecution and injustice through accusations of anti-Semitism, this will lead the British public to believe their lies and propaganda spuriously justifying their continued persecution. They have to be stopped, confronted and defeated. Those falsely smeared as anti-Semites should be readmitted to the party. Those smearing them should be investigated and tried in their turn for bringing the party into disrepute. And there should be real consequences for those outside the Labour party responsible for propagating the smears, like the Board and the CAA. And if Shami Chakrabarti is not prepared to stand up for innocent people in this, like Red Ken, perhaps she should leave the front bench. Last Saturday, 21st October 2017, there was a meeting in London for the victims of the campaign of smearing and suspensions by the Blairites and the Zionist lobby in the Labour party. These two factions have tried to hold on to their flimsy power base in the Labour party and defend Israel and it’s continued persecution and ethnic cleansing of the indigenous Palestinians by falsely accusing decent, anti-racist people, both gentiles and Jews, of anti-Semitism when they have rightly criticised Israel for this. The victims of this witch-hunt include, and some would go so far as to say, specifically target, Torah-observant and self-regarding secular Jews. Many of these Jews condemn Israel and its brutal maltreatment of the Palestinians because of their liberal Jewish beliefs, which they feel command them always to side with the oppressed, never with the oppressor. They object to the massacres, home seizures and ethnic cleansing of Israel’s indigenous Arabs precisely because it is how Jews have been historically persecuted. Thousands have had their names besmirched, and been suspended and excluded from the Labour party. They include Ken Livingstone, Jackie Walker and Tony Greenstein himself. Now the victims are fighting back, and demanding an end to the witch-hunt. Mr Greenstein has put up an article about the meeting today on his website. He describes recent events which saw the Jewish groups at the Labour party demand the expulsion of the Jewish Labour Movement, the Zionist group in the Labour party that has been responsible for many of these smears. Greenstein has also pointed out that while the organisation claims to be Jewish, the majority, or at least a sizable minority of its members are actually gentiles. He also discusses personal embarrassments to the Blairites’ and Zionists’ leaders. The two factions have overreached themselves in the expulsion of the very respected Israeli academic and socialist, Moshe Machover. Machover is a distinguished academic and mathematician, and his Matzpen organisation in Israel includes both Jews and Arabs. The Blairites summarily expelled him, and now have found themselves inundated by calls by his supporters to have him reinstated. The time has come to fight back. The Left simply cannot allow the Right to continue with expelling those they don’t like. The Momentum leadership under Lansman, which should have taken on the fight against the witch hunt has, instead, got into bed with the witch hunters. It was Lansman and his friends who laid the basis for Jackie Walker’s suspension from the Labour Party by removing Jackie from her position as Vice Chair of Momentum. If people really want to see a radical and socialist government under Jeremy Corbyn we have to stop the witch hunt in its tracks. Indeed we need to be rooting out the Blairite bureaucracy. •1. No auto exclusions Everyone has the right to a hearing. The Chakrabarti Report found that Labour’s disciplinary and complaints procedures “… lacked sufficient transparency, uniformity and expertise” and failed to observe “the vital legal principles of due process (or natural justice) and proportionality”. •2. It is unacceptable that there are differing definitions of anti-Semitism. Anti-Semitism isn’t a difficult thing to define. It is hostility or hatred of Jews. You don’t need a 450 word definition unless your purpose is to conflate opposition to Zionism, the ideology that led to the foundation of the Israeli state and genuine anti-Semitism. This definition is itself too imprecise, open ended and uncertain. What makes it unacceptable is that it introduces and lays the basis for 11 ‘examples’ of anti-Semitism, 7 of which relate to Israel. In other words the whole purpose of the definition is to conflate anti-Zionism with anti-Semitism. Whilst Corbyn has not adopted these 11 examples the Labour bureaucracy has. We have therefore adopted the definition first espoused by Professor Brian Klug of Oxford University in his lecture ‘Echoes of Shattering Glass’ delivered in his 2014 lecture in Berlin’s Jewish Museum on the anniversary of Kristallnacht. 3. Thirdly our demand is that the Compliance Unit is abolished. It is completely undemocratic and unaccountable. Instead all disciplinary action is to be taken by elected bodies in future. It is important that LAW builds itself quickly in the coming months and engages in a series of activities, such as a picket of the NEC to demand the reinstatement of Moshe Machover to holding meetings and a conference. He also states that a four-person Executive Committee was elected, consisting of himself and Jackie Walker, Stan Keable, and Pete Firmin. The groups is actively looking for new members. Greenstein is exactly correct in his definition of anti-Semitism. This goes back to the League of Anti-Semites in Wilhelmine Germany and its founder, Wilhelm Marr. Marr defined it as a hatred of Jews as a race or ethnic group, without regard to Judaism as a religion or any other beliefs or ideologies. They had a revolting little rhyme about how the ‘swinishness’ was ‘in the blood’. He, and other critics of Israel and Zionism, have shown time and again that historically Zionism was peripheral to Judaism; that many Jews opposed it as a blasphemous secularisation of their religion; and that, horrifically, Zionists have had contempt for diaspora Jews, and have been willing to collaborate with genuine anti-Semites, including the Nazis for a brief period, in order to further their goals of creating a Jewish state in Palestine. And they have used the accusation of anti-Semitism to smear and silence their opponents. Despite the danger that they are crying ‘Wolf’, and that one day, because of their abuse of the term, nobody will be bothered by the emergence of the real wolves. Mr. Greenstein, Jackie Walker, Stan Keable and Peter Firmin have my very best wishes for their organisation and its aims. I hope that at long last, justice will prevail and decent people may at last be able to speak about Israel and its barbarous treatment of the Palestinians without fear of being expelled or slandered. Mike put up a piece yesterday explaining how he had been suspended by the national Labour party because of libels spread by the Campaign Against Anti-Semitism that he was an anti-Semite. These libels were repeated by the local Welsh press and then echoed by the local Conservative MP. As I’ve blogged many times before, Mike is very definitely not anti-Semitic in the slightest. He has friends of different races, and does not judge people on their ethnicity, religion or sexual orientation. He is proud to have been invited by one of his female friends to be a reader in a performance for Holocaust Memorial Day when he was at College. I remember his obvious pride in telling me how the girl, who was Jewish, told him that his performance reading some of the names of those butchered by the Nazis had left her profoundly moved. Mike’s crime is simply that he stood up for the very many other decent, anti-racist women and men, who have been falsely defamed as anti-Semites, simply because they have criticised the state of Israel for its discrimination and ethnic cleansing against the Palestinians. Those smeared have, as I have said, included both gentiles and Jews, many of whom have suffered abuse and violence themselves because of their Jewish heritage or, if they are non-Jews, because of their friendship and solidarity with Jews. The so-called Campaign Against Anti-Semitism is a McCarthyite Zionist propaganda organisation whose aim is to smear and libel opponents of Israel’s apartheid regime. Ever since its formation during Operation Protective Edge in the summer of 2014, when over 2,000 Palestinians, including 551 children were murdered by Israeli missile attacks and shelling of civilian areas, it has sought to tarnish supporters of the Palestinians and anti-Zionists with the label ‘anti-Semitism’. The fact that the CAA is officially a registered charity is outrageous. It provides no Public Benefit, the test of any charity nor are its activities remotely charitable. It is a nakedly right-wing political Zionist organisation. Last Friday it attacked a member of Hove Labour Party and a Momentum supporter Rebecca Massey. She has since received death threats. Yesterday it smeared the veteran Israeli Jewish anti-Zionist Emeritus 80 year old Professor Moshe Machover as ‘anti-Semitic’. With its attack on Machover, the CAA has reached a new low. A cursory search of its archives reveals almost nothing on fascist groups, who are anti-Semitic holocaust deniers. There are however 21 entries for Jewish Labour MP Gerald Kaufman, who supports the Palestinians, 70 entries for Jeremy Corbyn and 29 for Shami Chakrabarti – all of them hostile. There were 8 for Theresa May, but only to congratulate her! The CAA’s purpose is to limit freedom of speech by attacking as ‘anti-Semitic’ opponents of the Israeli state. Please support this petition. I’ve signed the petition, stating that I have done so because of its libels against Mike and other decent, anti-racist people. And the other people mentioned in Mr Greenstein’s introduction, who have also been falsely smeared as anti-Semites, certainly shows the malign nature of this organisation. I think Gerald Kaufman was one of those MPs, who were caught fiddling their expenses a few years ago. However, I have never seen anything to doubt his integrity as a genuine voice for peace and justice in the Middle East, to which he has been a frequent visitor. Like Gerald Kaufman, Jeremy Corbyn has also been smeared because he too supports the Palestinians. As for accusing Shami Chakrabarti, the civil liberties campaigner, this shows how deeply politicised the organisation is. The very accusation is farcical. I am also horrified and revolted that they have smeared the Hove Labour party member, and supporter of Jeremy Corbyn Rebecca Massey, and that the lady has received death threats as a result. Just as I am by their smear of Prof. emeritus Moshe Machover. Professor Machover has been referenced several times by organisations campaigning against the ethnic cleansing of the Palestinians. I believe I have seen him mentioned several times in articles in Counterpunch. The fact that they have so smeared such a distinguished scholar, not sparing his years, tellingly shows how utterly bereft of genuine integrity these people have. They are moral pygmies trying to support a brutal, racist regime through libels and intimidation against people who are their moral superiors in every way. The fact that they can only use libels also shows that they have no real arguments to support them, and can only attack their critics using twisted lies. combating genuine abuse and violence, and their failure to do so gives the lie to their claim that they are. It’s high time this bullying stopped, and the organisation was brought to account for its foul smears. Or you can go to Mike’s article at http://voxpoliticalonline.com/2017/05/06/no-council-seat-for-vox-political-writer-because-of-politically-motivated-interference/ and use the link there. Mike today has written another piece about the anti-Semitism smears against Jeremy Corbyn and his supporters. This time they’ve been regurgitated by pieces in the Grauniad and the Heil. More interesting, to me, was the fact that he is a former policy advisor. Why did he quit? Does he have an ulterior motive in resurrecting these claims? The Heil on Sunday article is about Corbyn supposedly re-igniting the race row by purging the party of Michael Foster, the Jewish donor who criticised his leadership. Mike begins by pointing out that the very title is inaccurate, as Corbyn can’t and doesn’t purge anyone. Johanna Baxter, the NEC members behind the purge of many of the Corbynites, has stated that the decision to expel members is taken by three member panels. Corbyn doesn’t sit on any of them. The appearance of the two articles in their respective papers at the same time suggests to Mike that they’re part of an orchestrated campaign against Corbyn. Foster isn’t a financier – he’s a show business agent, but he did donate £400,000 to the Labour party. This might explain why Simons in the Graun felt he had to rant about Jews being equated with banking. The article then goes on to make more allegations of anti-Semitism against the Labour leader. This story, complaining about the purge of a right-wing candidate, has been published at the same time as the Blairites are carrying out a mass purge of low-ranking left-wingers within the party, most notably the leader of Broxstowe council this weekend. This suggests to Mike that these articles are to mask and obscure the purge of low-ranking members by playing up the purge of a single, high-ranking member of the party. And Mike also points out the irony of a Jewish man complaining about anti-Semitism in the Labour party in a paper that explicitly supported Adolf Hitler and the BUF before the Second World War. Other bloggers, like Tom Pride, have also produced headlines from the Heil attacking Jews and Jewish immigration during the same period. Mike discusses a comment on Twitter by Eoin Clarke, remarking on the large number of people, who have been purged, who were also going to be delegates at the Labour party conference. Mike adds that Labour First, another Blairite body, has been contacting like-minded Labour members to attend the conference, in the hope of replacing the Labour leaders’ policies with their own. This is being done in the hope that this will force him to leave, either by making it impossible for him to do his job as leader, or to make him vulnerable to criticism. This is being done as they realise that he’ll probably win the leadership election on Wednesday. This is the real dichotomy in the Labour Party at the moment. Mr Corbyn may be accused of the most vile behaviour – falsely. Meanwhile, just look at the underhand tactics employed against him. It isn’t what This Writer calls democracy. There are a couple more things that can be said about these articles. Let’s deal with Joshua Simons’ article first. Part of his resentment against Corbyn and Momentum is that he believes they have a ‘visceral contempt for America and Israel’. This marks Simon out as Blairite Neocon. The Blairites were strongly in favour of the Atlantic alliance, and were partly the products of the Reaganite political initiative, the British-American Project for the Successor Generation, which wanted to guide suitable British politicians and media leaders – one of BAP’s other alumni was an editor of the Times – into a suitably pro-American stance. Reagan’s America was strongly pro-Israel, partly as psychological compensation for the America’s signal failure to win the Vietnam War. To make up for their country failing to quash the Vietnamese Communists, the American Right turned to celebrating Israel’s victories against the Arabs. And there are good reasons for despising the foreign policies of both countries. Having contempt for America’s long history of overthrowing democratic, left-wing regimes and installing brutal Fascist dictators, and Israel for its ethnic cleansing of the Palestinians does not automatically make someone either anti-American or anti-Semitic. Many of the people, who despise America’s politics, admire other aspects of the country, such as its popular culture and music. And very many of Israel’s critics have been Jews. These include Harold Pinter, who was a bitter and outspoken critic of the barbarity of America’s foreign policy. The great playwright also was certainly not reticent about robustly expressing his opinions about anti-Semitism. I heard from a friend that he once decked a man in queue he was in, after this fellow said something monstrous in favour of the Holocaust. As for the automatic connection between Israel and Jews around the world, this has been repeated a number of times by the Zionists, including Netanyahu. But it’s not true, and the ties between Israel and the Jewish community in America are becoming weaker. Norman Finkelstein has talked about how there was very little support, or even interest amongst Jewish Americans for Israel until the 1970s, and a growing number of young Jewish Americans are increasingly indifferent and critical towards it. As for his complaint that opposition to Israel leads automatically to hatred of Jews in Israel, that’s a very careful way of trying to avoid the reality that Israel was set up as the Jewish state. In this case, it is easy for Simons to claim that hostility to Israel equals hostility to Jews in Israel, as Israelis are Jews. But talking about Jews in Israel is away of trying to avoid Israel’s own self-image and identity as the Jewish state, and present it as another pluralist nation, of whom Jews are only one section of the population, and not the dominant population for whom the state itself was founded. George Galloway has pointed out that it’s difficult to avoid criticising the Israeli people for the atrocities committed by their country, as unfortunately Netanyahu and his right-wing coalition have the support of the majority of Israeli citizens. I am also very much aware that it is unfair to hold the whole nation accountable for what Netanyahu and his supporters are doing. There are many Israelis, who have shown great courage in supporting the Palestinians. These people are also under by Netanyahu and his cronies. There was a recent poll of Israelis, which found that a majority agreed with the statement that Israelis, who sided with Arabs, should deprived of their citizenship and civil rights. Such a finding should chill anyone, who believes in democracy, pluralism and tolerance. This also adds another twist to Simons’ contention that hatred of Israel is also leading to hatred of Jews abroad. If that poll is to be believed, a fair number of Israelis also hate Jews in Israel – the Jews that protest against nearly seven decades of injustice against the Palestinians, as well as the Mizrahim, the Arab Jews, who were recruited by the Israelis as a cheap labour force, and then rigorously segregated and discriminated against in order to make them discard their Arab culture. As for Simons’ rant about bankers, I’ve seen that used by the Republicans in America to try and rule out of bounds the entirely justified criticisms of the bankers and financiers responsible for the global financial collapse. The argument runs that as much anti-Semitism centres around the perceived Jewish control of the financial sector, then criticism of the financial sector is anti-Semitic. It’s a false syllogism. The people, who despite the financial sector, do so regardless of the particular ethnic or religious origin of its members. They’re outraged because the current financial system has destroyed the world’s economy, forced billions around the world into poverty, including destroying the economies of whole nations, like Greece, and then have the temerity afterwards to continue demanding the same bloated bonuses and pay rises for its chief executives, while shifting the burden for clearing up their mess onto the poor. But Wall Street, along with the other major corporations, heavily donate to the political parties in expectation that the politicos will enact legislation favourable to them. Shrillary Clinton is a case in point. She’s taken millions from Wall Street in fees for speeches, and is a firm proponent of the ‘light touch’ regulation that resulted in the financial collapse. Here in Britain, New Labour launched its ‘prawn cocktail offensive’ in the 1990s, aimed at gaining financial sector support, again by promising a ‘light touch’ on regulation. With exactly the same results as occurred in America. Part of Simon’s rant may also reflect Lord Levy’s role in funding the rise of New Labour. He was the link for the supply of money to Blair and his crew from the Zionist lobby. In short, Simons’ rant is an attempt to prevent criticism of the Neocons and corporatists of New Labour. It is not a genuine response to anti-Semitism, however hard Simon tries to insinuate that there is still rampant Jew hatred in the party. His rhetorical introduction to the accusation that Corbyn corruptly traded a peerage with Shami Chakrabarti in return for her clearing the party with the words, ‘some believe’, is an age-old Fleet Street device to get round a possible libel claim. It’s not being asserted as fact, merely as a belief, which is protected under law. As For Foster’s hit piece in the Heil, I think Mike and Eoin Clarke are exactly right. And underlying it is the same fear that New Labour and its corporate and Zionist backers are losing their grip on the party. And so Foster is doing everything he can to smear their opponents – Corbyn and his supporters – as anti-Semites, even though they aren’t, and include many Jews and activists with a long history of combating racism and anti-Semitism.